One of the biggest challenges readers visiting Piedmont face is deciding where to eat. It's a good problem to have. 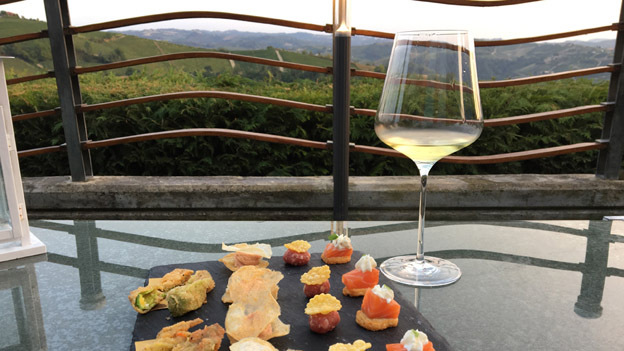 I can’t think of any wine region – or indeed anywhere in the world – that has such a concentration of phenomenal dining destinations all within a 30-40 minute drive at most from Barolo or Barbaresco. As if that were not enough, Mother Nature has blessed Piedmont with extraordinary raw materials and spectacular wines that are absolutely breathtaking together. The restaurants in this article have been chosen with the wine traveller in mind and are therefore mostly within a short distance from the major Barolo and Barbaresco-producing towns. Readers visiting Piedmont will find a mind-boggling array of dining choices, ranging from simple wine bars to more elegant dining rooms, including many places that are bit farther afield. What follows are some of my favorite spots for food and wine. This is not an exhaustive list, but rather a collection of restaurants I enjoy and have been to many times. One of the things I have learned over the years is that knowing what to order where is critical. With that in mind, I have pointed out signature dishes where applicable. Piedmont is strikingly beautiful pretty much all the time, but it is especially magical this time of year. The last days of summer melt into fall, temperatures drop, leaves burst into glorious expressions of color and the buzz of harvest and young wines in the cellars is in the air. 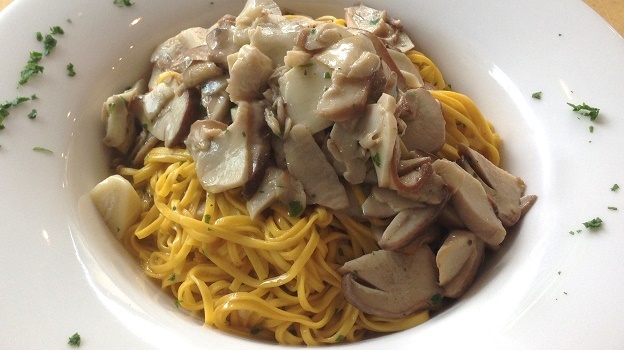 Mushrooms and white truffles add to the natural bounty of the Piedmontese table. Although Alba's famous truffle fair is held in October, the best truffles tend to start appearing in November. As the month progresses, crowds begin to thin out and while truffles are often at their best and most plentiful, which means they are also typically less expensive than they are earlier in the season. Of course, quality and pricing vary quite a bit from year to year. Don't be surprised if you see young children in any of these restaurants, even the most elegant. Of all the wine-producing regions I visit regularly, Italy is without question the most family oriented and kid friendly, which means parents don't have to sacrifice a great meal in order to be with their children, while the kids have an opportunity to be educated at the table. As I have written before, wine storage continues to be an issue in Piedmont’s restaurants. This year I have added a list of restaurants where wine storage and/or service are poor. It is not an easy list to put together, because many, if not most, of these establishments offer very good food and/or ambience. But the simple reality can’t be ignored. In knowingly serving flawed wines, these restaurants are saying that they do not respect or care about their customers. Readers should feel no hesitation in sending back bottles that have been damaged by heat. That is the only way Piedmont’s restaurateurs will get the message. As much as it pains me to say this, taken as a whole, Piedmont lags the world’s other elite wine producing regions by a significant margin when it comes to wine service, and in particular storage of fine wines. Let me be clear: Piedmont exists because of one thing and one thing only: Wine. Without the wine industry there would be fewer jobs, fewer restaurants, much less wealth and no tourism to speak of except for a few weeks during the fall truffle season. When will Piedmont’s restaurateurs learn to take care of their most valuable and most profitable asset? Not all restaurants can have a gorgeous, temperature-controlled cellar. That is understandable. But how much does it cost to a buy a few refrigeration units? Will the average patron notice an extra euro or two per bottle to pay back that investment? Of course not. But Piedmontese restaurateurs largely do not see it that way. Suffice it to say I have been served cooked and/or damaged wine in virtually every restaurant in Piedmont, so it is very much caveat emptor. Still, I don't think there is anywhere better to be in the fall than Piedmont. Barolo, Barbaresco and white truffles in a good year are as good as it gets. Stunningly evocative landscapes enshrouded in the autumn fog and a good meal at one of Piedmont’s top spots will be more than enough to make visitors start planning a return trip. Things can get a bit hectic during the peak fall season, so reservations are essential. Antica Corona Reale, known simply as Da Renzo, is a must during truffle season. Da Renzo is located in Cervere, which is a bit of a drive from the Barolo zone, but closest to La Morra. The food is terrific year round, but in the fall Renzo is the place to be. 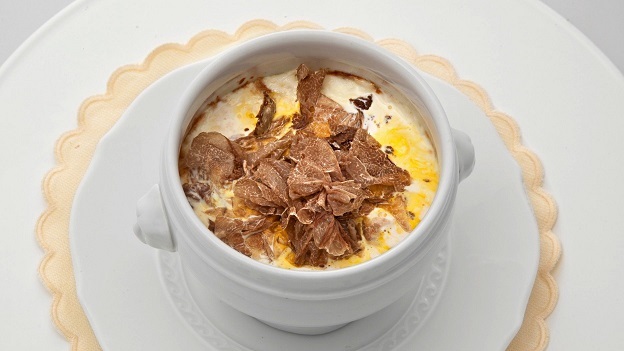 Proprietor Gian Piero Vivalda makes the single greatest truffle dish in Piedmont; the heart attack-inducing, poached egg in cocotte, essentially an egg poached in butter and cream, then topped with shaved truffles. If there is a dish visitors must experience at least once, this is it. 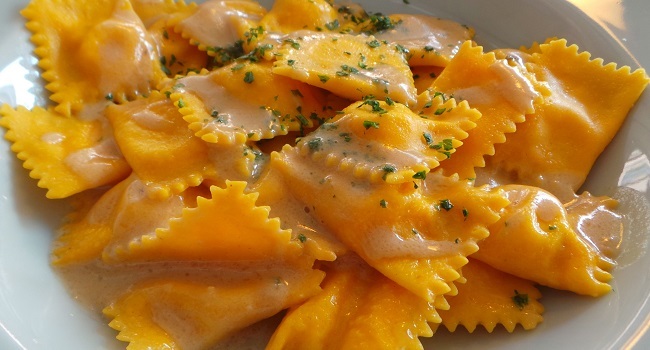 Other great choices include the Tortelli al Seirass and the Châteaubriand for two. Wild leeks and snails, both local to Cervere, are not to be missed. I don’t go crazy for either frogs’ legs or tripe, but those who do swear by Da Renzo’s versions. Service is very good. The wine list is well chosen, but storage is inconsistent and the program overall remains the Achilles heel of this otherwise exceptional Piedmont benchmark. Most recent visit: November 2012. Antica Torre is another of Piedmont’s reference points. Located just across the road from the Produttori del Barbaresco, Antica Torre is a hit with locals, winemakers and tourists alike. The food is simple, honest and presented with no makeup. Prices reflect the everyday, working class values of another era, which will thrill travelers on a budget. Antica Torre’s wine list is a bit Spartan and simple, but consistent with the setting. In the summer, the outdoor seating is a nice plus. Signature dishes include the antipasti (served either singly or as a sampler, the tajarin and the rabbit. Readers will want to call ahead, as Antica Torre is often closed in the evening. Most recent visit: August 2017. Barolofriends, a wine bar in the center of town, is one of the most exciting additions to the eating and drinking scene in Piedmont. The brainchild of proprietor Paolo Annoni, Barolofriends is the perfect place to stop by for an informal meal or glass of wine. 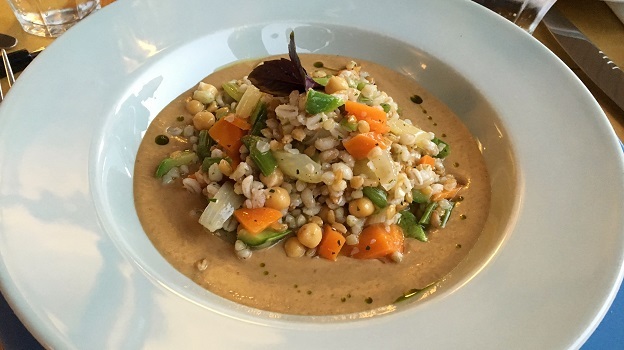 Chef Imer Pegoraro’s menu is rich in tradition, often done with a few twists. 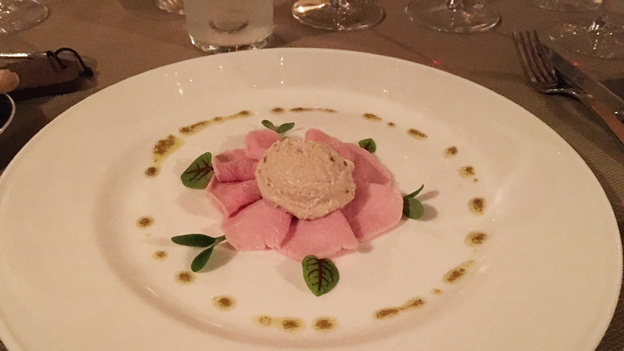 Pegoraro spent several years with Massimo Camia at Locanda del Borgo Antico, and it shows in dishes like the vitello tonnato, which is unusually refined for a restaurant of this level. The room is warm and inviting, while the food is delicious and reasonably priced, all of which makes it easy to return. Best of all, the kitchen is open all day, from 11am to 10pm, unusually flexible by Italian standards. 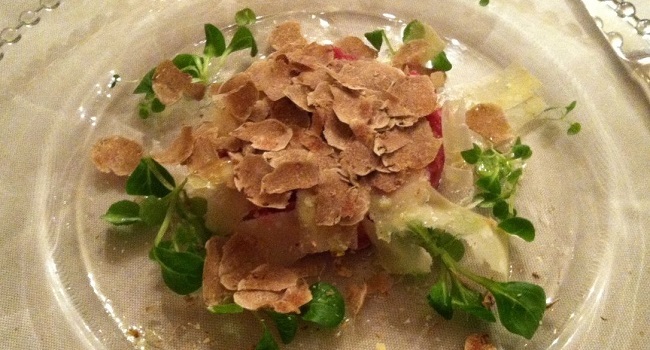 I prefer the simpler dishes, including the tajarin (pictured above), vitello tonnato and carne cruda. Most recent visit: July 2017. 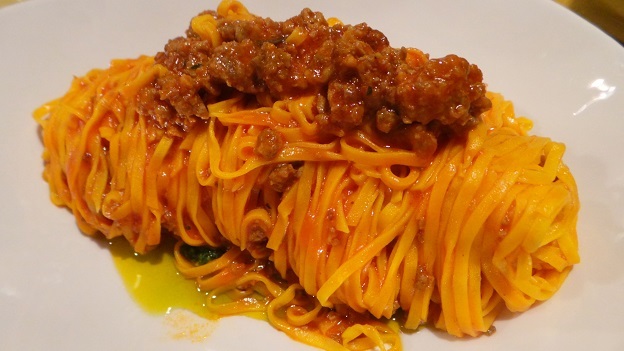 No trip to Piedmont is complete without a meal (or two) at Centro Storico. Proprietor Alessio Cighetti is larger than life, and so is a night out at this iconic winebar in Serralunga’s historic center. Cighetti’s wife, Stefania, runs the front of the house, while her mother takes care of the cooking. Centro Storico is distinguished by a wine list that will shock even the most seasoned of travelers for its depth, especially considering the otherwise no frills setting. Champagne is a strong suit, and is often my drink of choice here. Growers and grande marques are represented with equal breadth. The simple menu usually consists of three/four choices of appetizer, pasta, main and dessert, mostly leaning on the classics, and all impeccably prepared. Centro Storico is a favorite among locals, so don’t be surprised if you see one or more winemakers here on any given night. Paccheri with tomato sauce and eggplant Parmesan are a nice break from the Piedmontese classics. 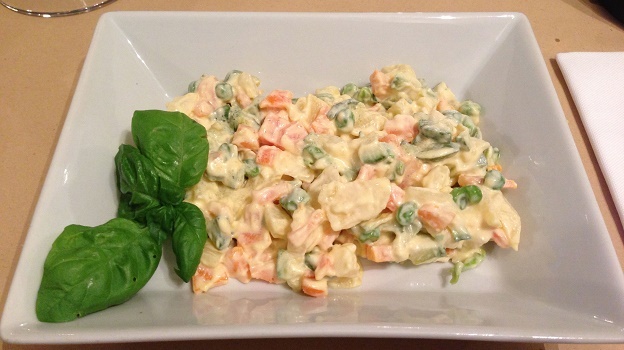 I also like the insalata russa (pictured above), the salumi and the carne cruda. If homemade gelato is available (not usually on the menu) don’t miss it. Most recent visit: August 2017. Chef/Proprietor Maurilio Garola is going through an especially brilliant period at La Ciau del Tornavento. La Ciau boasts one of the most beautiful dining rooms in the Langhe, especially during the day or in the summer, when guests will be dazzled by the views. The cellar has always been jaw dropping, but the food now is better than ever. Several recent meals have all been superb. 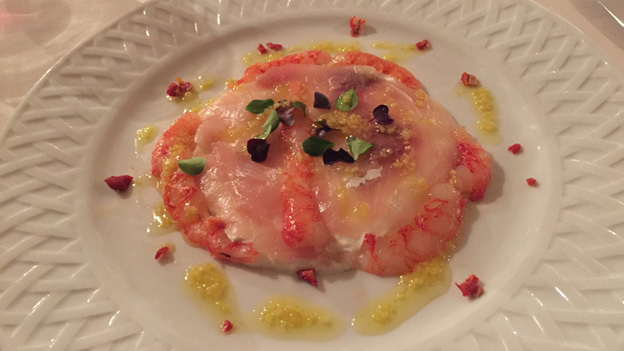 I prefer to stick with the classics, but La Ciau is one of the few restaurants in Piedmont where diners will find just as much pleasure in some of the more adventurous, creative choices that adorn the menu. The squid cappuccino I had recently was utterly sublime. Few people have done more to support local wineries than Garola. The extensive cellar at La Ciau will leave visitors drooling. Let’s leave it at that. An extension to the cellar, which includes space to host visitors, was recently completed. 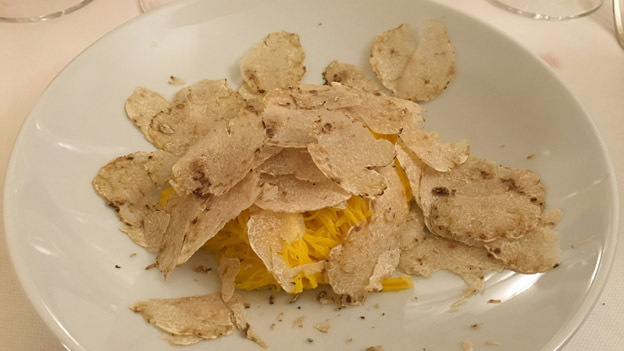 Signature dishes include the fried hazelnut-crusted shrimp, carne cruda, tagliolini, Agnolotti del Plin, Plin di Seirass and anything with white truffles. My favorite main courses are the whole roasted meats. Lastly, I suggest avoiding La Ciau during weekends in truffle season, when the rush of hungry diners stretches the staff to the maximum. Most recent visit: August 2017. Il GrecAle is a breath of fresh air. As good as the classic Piedmontese classics are, it’s nice to have a change of pace every now and then. Chef/Owner Alessandro Neri’s fish and seafood menu will transport readers to Liguria, or perhaps somewhere a bit more Mediterranean, with bold, lusty flavors and whimsical creations that exalt traditional coastal flavors. The wine list naturally leans heavily on whites, but there are plenty of red wines to choose from as well. A recent dinner at GrecAle was terrific. Highlights included the Sicilian tuna tartare, burrata ravioli and ferrazuoli with octopus. The food could be a bit more refined (for example the olive oil was a bit much on the ferrazuoli), but everything we tasted was delicious. Most recent visit: August 2016. Timeless, elegant and classic. That is what comes to mind when I think of Guido da Costigliole. Tucked away in the hills of Santo Stefano Belbo, in the picturesque Relais San Maurizio, Guido is one of the meccas of fine dining in Piedmont. Andrea Alciati and his partner Monica Magnini run Guido with palpable enthusiasm and passion. The Alciati family has been at the forefront of Piedmontese cuisine for several decades. Guido and Lidia Alciati, Andrea’s parents, opened the celebrated Da Guido in Costigliole in 1961, long before Piedmont and its wines were fashionable. Even back then Da Guido was one of the most famous restaurants in Piedmont. Guido Alciati was legendary for taking huge positions in wines that would go on to become icons, like the Produttori del Barbaresco's 1970s Riservas and Luciano Sandrone’s first Barolos. Upon Guido Alciati’s passing his three sons went in different directions. Andrea settled in at the Relais, not too far from the original Da Guido, while brothers Ugo and Piero went on to open their version of Guido first at Pollenzo and now in the Fontanafredda complex in Serralunga. Diners will find a menu built on lighter, modern-day interpretations of the classics, along with a few more inventive creations. The extensive wine list offers myriad choices of both local and international wines. Readers can bring their own wines for a modest corkage fee, which is rare in Piedmont. Even better, Guido will build tasting menus for diners who would like to supply their own truffles. Vitello tonnato, agnolotti, stuffed peppers and hazelnut-fed veal are all special. Most recent visit: October 2016. Several recent dinners at Ristorante Guido have all been phenomenal. When the iconic original Guido in Costigliole closed, brothers Andrea, Piero and Ugo Alciati split up. Andrea went on to open Guido in the Relais San Maurizio, while Piero and Ugo moved their new home at the University in Pollenzo, where their food was good, but too often inconsistent. A few years ago Piero and Ugo Alciati decided to start fresh at Fontanafredda. Since then, they have been on a roll. 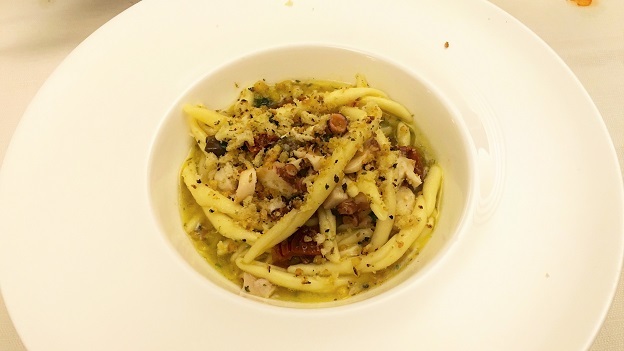 Today, Guido Ristorante competes for the top spot in Piedmont, no easy feat, to say the least. The striking rooms at Villa Reale in the Fontanafredda complex create a feeling of timeless elegance. Updated takes on the classics and some of of Licia Alciati’s creations form the core of the menu. Guido’s winelist leans heavily on wines from Oscar Farinetti’s empire, but does so in a whimsical fashion that manages to avoid feeling overly commercial or heavy handed. For the total experience of food, ambience and service at the high end, Guido Ristorante is as good as it gets. Most recent visit: November 2016. Angelo and Maria Cristina Rinaudi have recently moved to La Morra from Castiglione Falletto, where they ran the highly successful and popular Le Torri for many years. 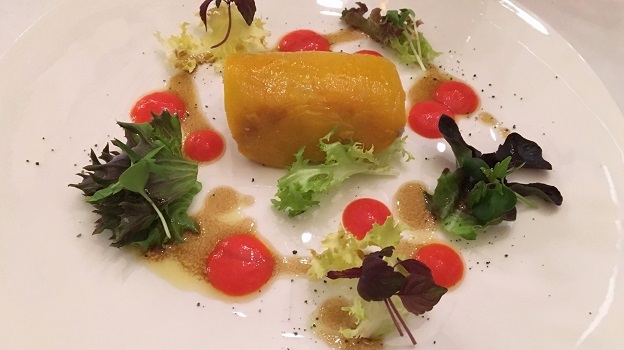 Mangè is typical of the new breed of restaurants that have begun to spring up in Piedmont. The kitchen is open from late morning straight through dinner. Readers can expect a small menu with an emphasis on the classics and very reasonable prices. On Thursdays, Angelo’s father brings fresh seafood back from the market in Torino, which makes for a nice break from the meat-heavy dishes that are so typical in the Langhe. The wine list is quite extensive for a small, informal restaurant. Mangè is perfect for a simple, informal meal, especially if keeping to a tight budget is a priority. Most recent visit: July 2014. It's easy to miss the tiny Mara dei Boschi storefront. Don’t. 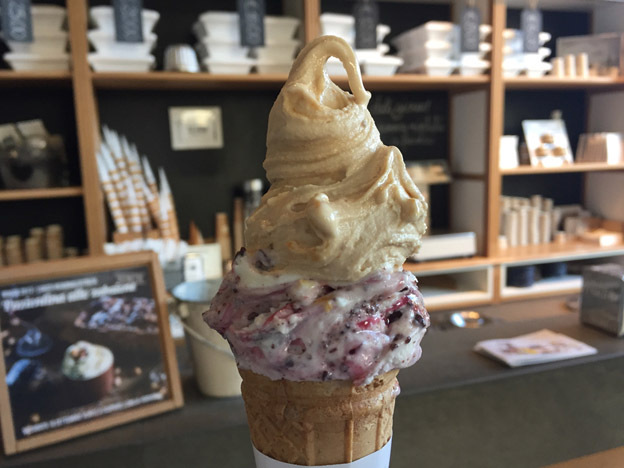 Tucked away off of Via Vittorio Emanuele, Alba’s main pedestrian street, Mara dei Boschi offers a small but exceptionally well-curated selection of artisan ice creams ranging from the classics to more adventurous choices, like the ginger gelato I enjoyed recently. With a little luck, visitors can see ice cream being made on the premises. Most recent visit: August 2017. I have been eating at the Osteria dell’ Arco for more than twenty years. A favorite going back to the days when I had basically no money, Osteria dell’ Arco remains one of Alba’s stalwarts. Diners will find a menu rich in the classics along with an excellent wine list, all in a simple, traditional setting. I always feel the service could be a little warmer, but that is a relatively small critique. 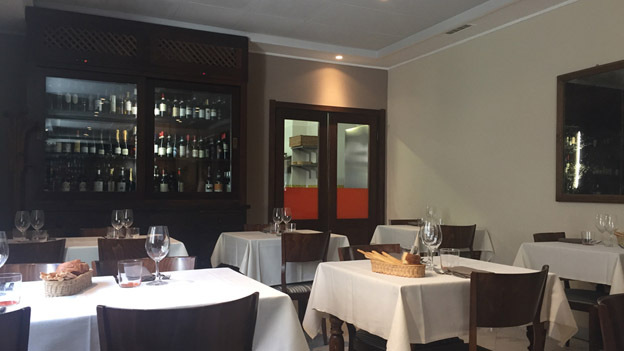 Osteria dell’ Arco is a also favorite among Alba’s working professionals, so reservations are absolutely essential, even for lunch. In my view, Osteria dell’ Arco captures the essence of what Italian restaurants do better than any other – offer affordable, everyday food made with uncompromisingly high quality standards at fair, working-class prices. It’s hard to go wrong with Osteria dell'Arco. Most recent visit: August 2017. The Ceretto family operates two restaurants in Alba, both in essentially the same space. Located on the ground level of a historic building in the old city center, La Piola specializes in mostly traditional dishes served in an informal setting. Piazza Duomo occupies the upstairs level and is the showcase for Enrico Crippa’s innovative, award winning cuisine. The menu at La Piola is rich in the classics, but with some twists that are quite welcome for visitors who want a break from Piedmont’s typical fare. Ceretto wines are featured heavily, with the rest of the list coming from Ceretto’s retail online wine partner. While the strategy of this kind of vertical integration is appealing to owners from a financial perspective, the reality is that the list at La Piola lacks imagination. Given the high quality of the food, La Piola would be far better off showcasing the best wines of the region, but that does not appear to be the aim. Regardless, diners can order from Piazza Duomo’s comprehensive wine list, which is what I suggest. Service on the day I visited was exceptional and welcoming, something that is not always the case in Piedmont. 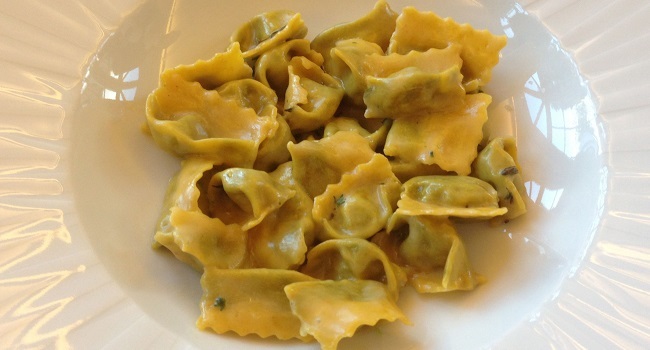 Agnolotti and fried zucchini flowers (when in season) are both delicious, while the various faro and soups make for a nice break from some of the region’s richer fare. Most recent visit: October 2016. A former monastery dating back to the days of Inquisition in the 1600s, the Relais del Sant’Uffizio is a gorgeous hotel and restaurant nestled in the rolling hills of Monferrato, just outside Asti, in the heart of Barbera country. The restaurant was terrific on two recent visits, although the reality is that the overall quality of dining in Piedmont has exploded over the last 20 years, such that the food at Sant’Uffizio today is excellent, but has much more competition than it did years ago. The menu offers a combination of classics along with a handful of more creative dishes all done with a modern, light touch. Visitors will find a small but well-chosen list with plenty of good options. Service is professional and attentive. The Locanda does both traditional and more modern creations very well. Most recent visit: July 2014. La Romana is a fabulous place to stop by for a refreshing gelato. Located just across the street from Piazza Savona in Alba, La Romana is also very easy to reach. 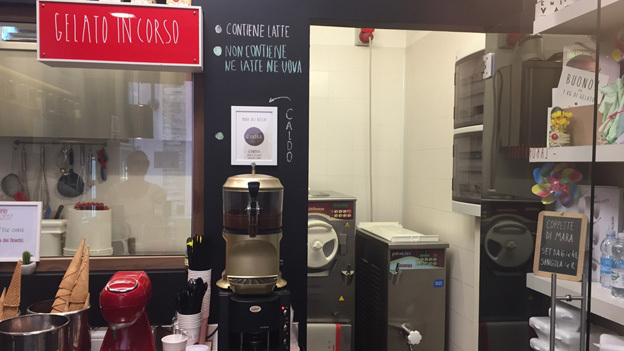 The Corso Italia shop is the Alba outpost of a chain of high-end ice cream shops founded in Rimini in 1947. La Romana focuses on natural ingredients for a series of inventive and delicious gelatos that are a nice break from the more tried and true flavors. Not that there is anything wrong with those, but a little variety is always nice. Readers will find many reasons to return, let's leave it at that. La Romana’s croccante all'amarena – ice cream with amarena cherries, meringue and hazelnuts – is a personal favorite. I had seconds during my last visit. Most recent visit: August 2017. A few years ago, the Bovio family sold the restaurant Belvedere up until then a local icon, and moved to their current location, just outside the La Morra town center. Ristorante Bovio is smaller and more intimate than the Belvedere, and that is just fine. The food is pretty similar to what it has always been, which is to say rich in the classics. The wine list is extensive, but I wish the wines were kept and served a little cooler. Service is warm, friendly and incredibly accommodating. In other words, what hospitality is all about. Two recent dinners were fabulous. Go with the classics. Most recent visit: October 2016. Il Centro, one of Piedmont’s timeless restaurants, is very much a family affair. Enrico Cordero is an affable, warm host. His wife, Elide, runs a kitchen that deftly manages to be both traditional and contemporary. Their son, Giampiero, looks after the extensive cellar with an unbridled enthusiasm that makes it a pleasure to pore over the list. My preference is still to stick with young wines. Il Centro is the perfect place to sample some of the super-classics that have all but disappeared from menus today, including eel, snails and finanziera (a sautée of sweetbreads and other leftover bits of meat) that is perhaps the most traditional of all Piedmontese dishes. Most recent visited: August 2017. La Coccinella will delight fans of classic, old-school Piemontese cooking. Located in Serravalle Langhe, this small, restaurant run by brothers Alessandro, Massimo and Tiziano Dellaferrera is convenient to Serralunga and Monforte, but will require a bit of a longer drive from other parts of the Barolo zone. The ambiance is homey, warm and inviting. This is Piedmont comfort food at its best. Gems are sprinkled throughout the wine list. You aren’t likely to see too many tourists at this haunt mostly frequented by locals and those in the know. It’s hard to go wrong with the classics, but La Coccinella is also one of the few places to where fish and seafood are exquisite. The shrimp and amberjack crudo and seafood lasagna are both superb. Last Visit: August 2017. These restaurants get low marks for wine storage and/or wine service. All of them offer good or even outstanding cuisine, which makes their indifference towards wine and their customers all the more incomprehensible. Of course, it takes several years (if not longer) to move through inventory, so even if all of these restaurants upgraded their wine programs immediately they would all be sitting on many vintages of wines that have long been ruined. Enoclub, Alba – Was it the cooked bottle of young Elio Grasso Barolo or the stack of magnums of 2007 Conterno Barolo Cascina Francia roasting at a hot room temperature that I found most dispiriting? I don’t remember. 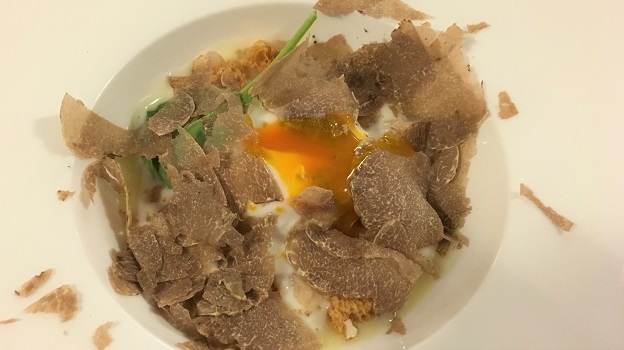 All’Enoteca, Canale – There was a time when Davide Palluda was my favorite chef in Piedmont. I would literally get off the plane in Milan and drive straight down to the Enoteca for lunch. But too many cooked wines and a total lack of hospitality have kept me from going back. Osteria del Vignaiolo, La Morra – The food can be quite good, but I have been served too many cooked wines, including a memorable (and not for the right reasons) bottle of Roberto Voerzio Barolo. 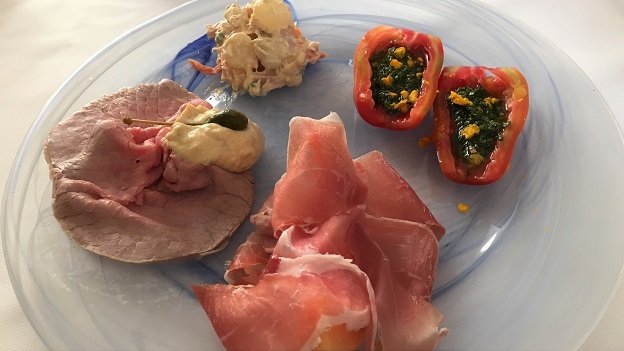 Piazza Duomo, Alba – My most recent dinner at Piazza Duomo was the single worst dining experience I have had in twenty years of visiting Piedmont. Two cooked Barolos and one oxidized wine should have never been served in a serious restaurant of this level. But they were at Piazza Duomo. Enrico Crippa’s brilliant and innovative cuisine – and its truly both of those things –deserves better. Trattoria della Posta, Monforte d’Alba – La Posta is one of the most striking dining rooms in all of Piedmont, but I have had far too many disappointments with wine, including recently released wines damaged by poor storage. Although the fall truffle season is every bit as magical as it is evocative, in recent years I have started to appreciate other times of year as well. Tourists are far fewer, reservations are much easier to come by and the food is every bit as delicious, even without the truffles.